We have a field full of poppies close to us that are in bloom every year around Memorial Day. 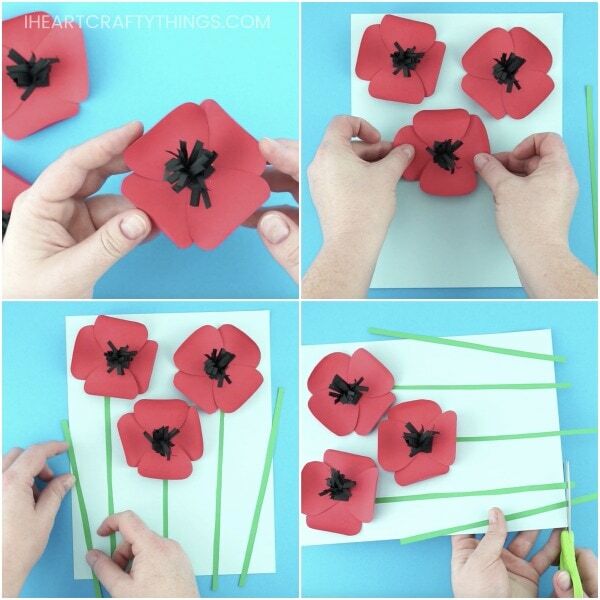 They are quite the sight to see and were the inspiration behind our paper poppies craft we are sharing today. The combination of the red flower petals popping of the page along with black strips coming out from the middle of the flowers gives this pretty paper poppies craft an awesome 3-dimensional effect. We’ve included a free template to help you create your own gorgeous poppy flower craft. 1. 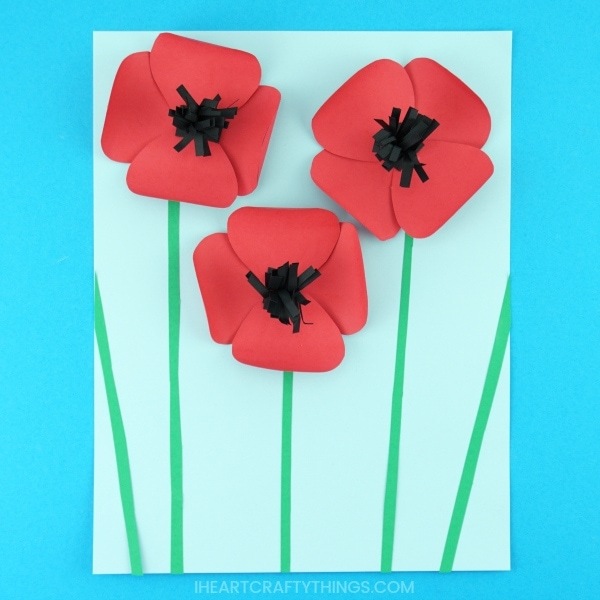 Print out the paper poppies craft template on red cardstock paper. Cut out the pieces of the template. 2. Carefully bend and roll the end of each of the poppy flower petals up to give the petals dimension. 3. 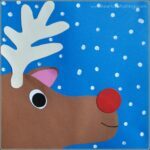 Cut a piece of black cardstock about 4 1/4-inch by 1 1/2-inch. Use your herb scissors to cut 1-inch slits along the black rectangle. Fold the rectangle up into a circle. Add glue at the end to close it shut. 4. Cut a small slit on opposite ends of the bottom of the circle. Then fold the two flaps down to create a space to glue the piece on the inside of the flower. 5. Turn the black section right side up. Bend and push the small black pieces apart to give extra dimension. 6. Glue two of the paper poppy flower petals together to form a flower. Add glue in the middle of the flower and glue down the black middle section of the flower. 7. 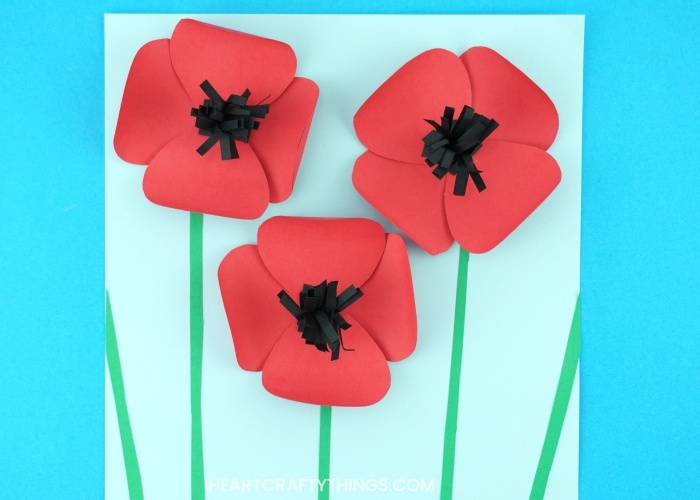 Glue your three paper poppy flowers at the top of your light blue cardstock. 8. 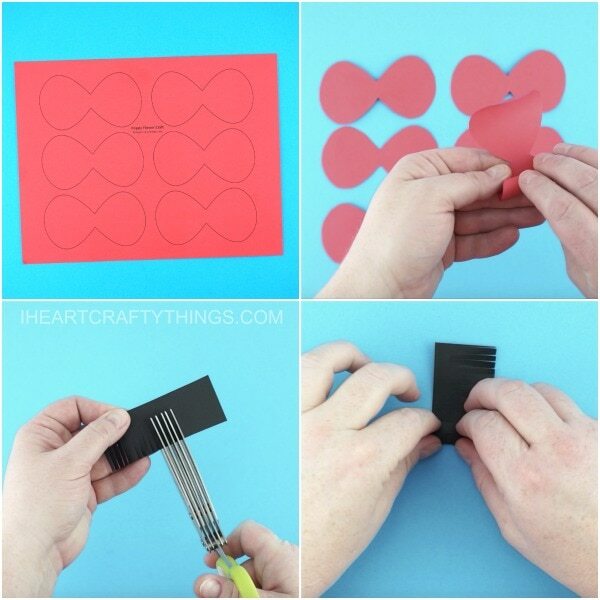 Cut out small stems from your green cardstock. 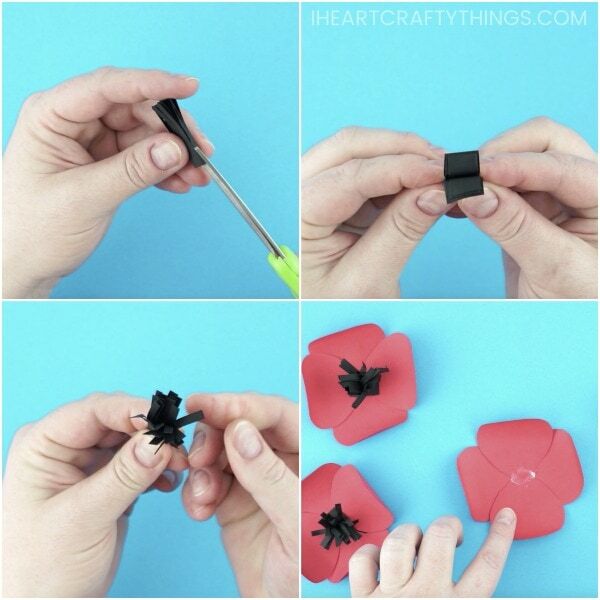 Glue them under each of your paper poppies. If desired, glue a couple more stems coming off of the page to give the appearance of more poppy flowers. 9. Use your scissors to cut off any flower stems that are hanging off your light blue cardstock. 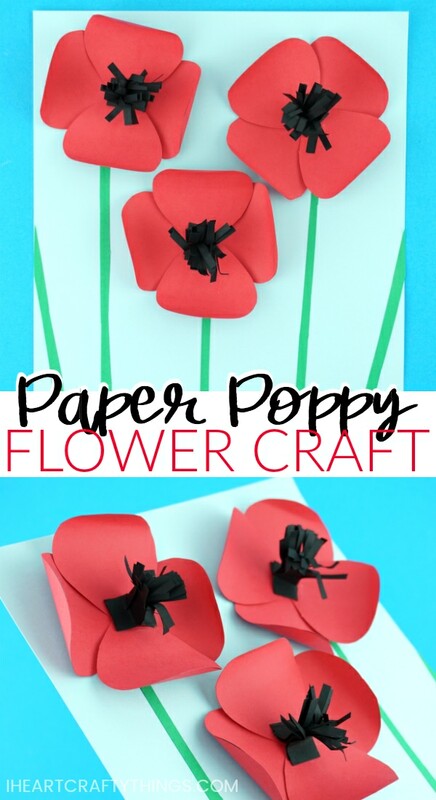 Your paper poppies craft is finished! 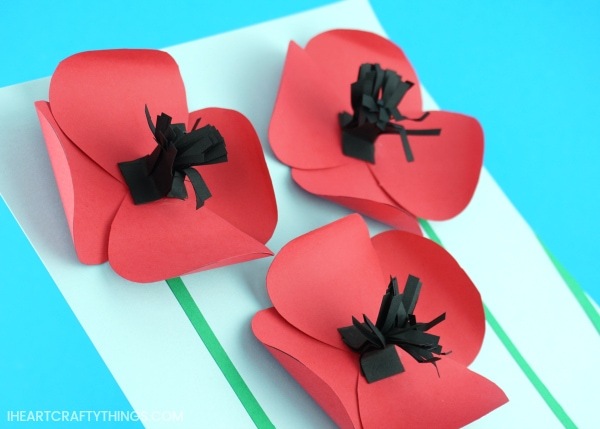 Not only can you make this paper poppies craft when poppies are in bloom in your area but it also makes a perfect craft for Remembrance Day on November 11, which is also known as Poppy Day. These colorful 3D paper tulip flowers make a perfect spring flower craft for kids. Hyacinth flowers are my favorite! Here is a fun and simple way to create a paper hyacinth flower craft. 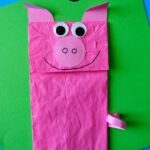 You can also turn them into lovely cards for Mother’s Day. Compliment your flower crafts by adding some colorful 3D paper butterflies at the top of them. 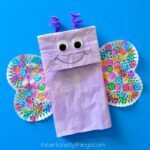 Kids will love creating their own unique butterfly wing designs.